First TURBO KID Trailer Will Please Retro PA Fans! It must be Turbo Kid day here at QE! We literally just chatted with the directors of super fun 80s throwback Turbo Kid and they go and drop the trailer on us! 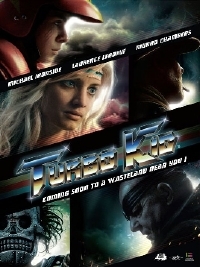 Turbo Kid is a loving tribute to post-Road Warrior 80s flicks where mutants and shoulder pads ruled the wasteland. Based on this quick teaser, it's sure to please retro PA fans to no end. We're definitely really looking forward to this one. In a post-apocalyptic future a young solitary scavenger obsessed with comic books must face his fears and become a reluctant hero when he meets a mysterious girl. It's a blood-splattered love story of an orphaned hero and his new best friend fighting evil in post-apocalyptic 1997. Turbo Kid is an official selection at Sundance 2015 where it is having its world premier. From horror masterminds Ant Timpson (The ABCs Of Death 1 & 2, Housebound) and Jason Eisener (Hobo With A Shotgun). It is directed by the hive-mind of RKSS. blood spattered apocalyptic mutants....on kid's bikes...Bwaahahahahahahaha! When the soundtrack kicked over into a fat Eurodisco groove at 0:24 I was sold! Can't wait!